Studio9000 Multi-channel Real-time data/disk Video Recorder and streaming system is the industry's most compact 2U rackmount streaming system with IRIG-B or GPS frame time-stamp capability designed for 4K broadcast video capturing and recording applications that streams 4K IP Video. Cepoint ST9000DVR-IRIG-sv7 is STANAG and COTS MIL-STD-910 compliant video system. DALLAS – May 8, 2017 - Cepoint Networks released it's latest real-time disk video/data recording and streaming system built with 3G HD-SDI Multi-channel capture and playback ports, with IRIG-B or GPS frame time-stamp capability. Studio9000-sv7 is designed for High definition Broadcast and Surveillance real-time video capturing, recording and playout applications conforming to SMPTE 342 standard and has capability of simultaneous video/audio capture and recording and 4K video Transport over 10G. Other capabilities includes synchronized capture and recording of high speed data and 4K video with precision IRIG-B or GPS hardware time-stamps of video or image frames. Also included is an embedded or removable Solid State Disk storage media capable of storing up to 8-hours or more of data or content. The industrial grade unit is designed for high speed imaging and video recording for scientific analysis, and can capture and record simultaneous multiple streams of video or images upto 4K res from any source, HD-SDI, computers, VGA sources, X-Ray machines, NTSC or PAL component or composite, analog or digital video sources in uncompressed AVI or compressed, H.264, MPEG-4, M-JPEG and quite suitable for tracking and analyzing images and videos of fast moving objects; Bullet & Ballistic Testing, high end surveillance such as Airborne video surveillance, X-Ray, FLIR, Machine Vision, Radar imaging,....etc.. Resolution and frame speed can range up to 2048 x 2048 and up to 100,000 fps or more. Since the unit was designed with mobility and laboratory environment in mind, an optional 28V or 48V DC powered version is also available in addition to the standard 110-240V AC powered unit. Cepoint's Studio9000 video acquisition systems are being used in Broadcasting, R & D laboratories, and defense agencies for complex and advanced imaging applications. Cepoint is a systems integration, consulting, and manufacturing company with emphasis in custom and specialized IT systems and video products and solutions for defense, R & D, security and communications applications. The company also manufactures high performance, industrial strength computing systems, enterprise storage raid, network communication systems, applied computing products, and technologies for scientific applications and industrial processes, as well as RAID, applied computing products, for Telecom, Government, utilities and industrial markets. for mission-critical applications, servers, VoIP ,video surveillance, real-time IRIG-B or GPS time-stamp DVR's, rugged portables, NEB's compliant computers. How much energy can your infrastructure save using a farm of 40TB 1U rackmount NAS servers? Energy Saving Network Attached Storage (NAS) and energy efficient data storage servers is yet another way to cut down on power consumption and environmental pollution with clean renewable energy. Cepoint Networks is leading the way with its new unveiled energy efficient NAS systems. Introduced for a variety of industrial and commercial applications, including IT and Telecoms data centers, infrastructure managers and system engineers dreaming of low power, low cost energy saving systems, Cepoint Networks, 40TB NAS server running on DC or AC powered grids is talk of the industry as many companies are starting to shift to small compact but power computing appliances for their private or public hybrid cloud. Cepoint a company specialized in multi-faceted IT industrial systems and communications has started putting more emphases on building their data storage and standard server systems with low cost, low energy utilization systems powered on 110V DC or 48V DC. battery grid. It is no surprising companies like Google and Amazon are beginning to go Green at their data centers globally. “...This is the future trend and way to go if IT and Telecoms industry is will sustain the continual demand for more power every four to five years..” said Benny Adama, Senior IT Consultant at Cepoint Networks. RM-1700 series 48V /110DC powered 4/8/12-bay 1U enclosure single storage solution for 24 x 7 NAS data storage and optimized for use in low power grid data centers or unstable power electrical environment. The TELCO carrier grade, NEB’s compliant platform RM-1700 storage system scales -Out to unlimited capacity and expands beyond initial configuration without taking down the system. A fully configured unit is easily scalable without any hassle of down time or delayed deployment. This system is very suitable for other Real-Time mission-critical applications in Telecommunications environment and security, such as large scale VoIP, Telephony and campus wide data warehouse. The efficient power saving systems supports RAID levels 0, 1, 3,10, 5, 5EE, 6, 50, 60, and with all its equipped features, RM-1700 are deployable as a NAS, iSCSI SAN or Fibre-channel SAN or stripped down JBOD or DAS (Direct Attached Storage) depending on required application needs and environment, thus making R1700 is a configurable or re-configurable Unified Enterprise storage server computing solution, saves enterprises and their IT departments thousands of dollars, deployment and maintenance or management headaches that otherwise would have been incurred or encountered in tinkering or trying to adapter different or varied solutions from multiple vendors. Better voice recordng and logging---with a complete range of passively or actively tapping categories, Cepoint products are compatible with all diverse interfaces, such as IP, T1, E1, Analog, PCM, Radar wireless etc. 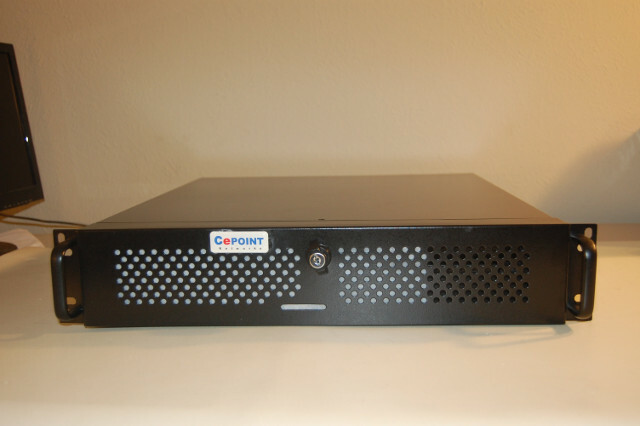 Also, the rugged 19” rackmount compact size makes it easily installed into compact server center.